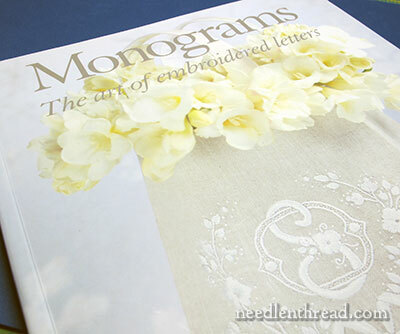 Monograms: The Art of Embroidered Letters – Winner! Today we get to find out who won a copy of Monograms: The Art of Embroidered Letters by Susan O’Connor – a book that is currently out of print, but in the process of being re-printed. It’s hard to find an original edition of this book, and if you do, it’s often Very Pricy Indeed. So, last week, to help spread the Love of Monograms to all, I decided to give away a copy of the original edition. And today, one lucky gal out there will find out that she gets to add this lovely tome to her needlework library! I really wish I could send each of you a copy of this book. It’s such a good book – and I’m so happy it’s being reprinted and will be available later this year! What appeals to you most about hand embroidered monograms? (Is it the personalization? The elegance of them? The timelessness of them? The techniques used, which can translate into other types of embroidery? Is it a nostalgic thing? Is it that you love the threads and stitches used? Etc.) Just tell me why hand embroidered monograms speak to you. And it was fun – and inspiring – to read your answers! Most of us seem to like a combination of everything a monogram represents, from the artistry of the monogram, to the individualization implied by it, to the nostalgic connections to monograms in their own lives or to the past. Well, on to the winner! I have studied calligraphy for almost 30 years and embroidery almost 40 (off/on until recently). It is these two interests that got me obsessed with designing monograms for embroidery. I would love to have this valuable resource for reference as I design and stitch! Thanks for a chance! Congratulations, Anne! Please drop me a line with your mailing address, and the book will be winging its way to you shortly. Thanks to all for participating – who knows, maybe we’ll do it again when the new edition comes out! May 21, 2014 Monograms – A Book Give-Away! October 28, 2014 Monogram Book Winner! Congratulations Anne I’m sure you will enjoy this lovely monogram book and thanks Mary for the give-away and I’m glad you enjoyed the comments. I look forward to next weeks blogs and I hope you have a stitching weekend. Congratulations, Annie! I hope that you enjoy your book! Choir performance this evening. Wish me and my singing buddies luck! Sing your hearts out! Good luck! Congratulations Anne! What a wonderful prize. I LOVE my copy and know you will treasure this special book. Have fun! Mary, you are so generous with your give-aways! Thanks for everything you do for us all. And Anne, congratulations, it’s certainly going to where it will not only be appreciated for it’s beauty but also it’s usefulness. Calligraphy and embroidery, this book was made for you. I’m pleased. Thanks Mary for the obvious love you put into your posts, giving us all, I’m sure, the feeling each post is just for me. Congratulations Anne! Perfect for you! Congratulations to all. I love reading your blog Mary. I recently tried to look up bloggers and needleshops from my old magazines in 2000-12 magazines. I am shocked to discover how many of them have stopped blogging and trading. I hope you continue to do for many years. You inspire a lot of readers. Dang..I never win anything…But hope you enjoy it sounds like you will make Great use of it..congrats again! Thank you for a very generous book give-away, and as always, your educational and inspiring daily blogs are a special treat. It’s good to hear that you get some enjoyment back from us for all you do. Congratulation Anne. This book sounds perfect for you! Does anyone else have a problem with the Monogrammed K. I look at the patterns. Some are indistinguishable from H. Some look like J and C together. I love S and Os if I had to chose for myself. I just wish there was a pretty K I liked.